A British Ecological Society funded study found that painted lady butterflies return from the Afrotropical region to recolonise the Mediterranean in early spring, travelling an annual distance of 12,000 km across the Sahara Desert. While the Palearctic-African migratory circuit is typically associated with birds, scientists from the Institute of Evolutionary Biology (IBE), a joint research centre of the Spanish National Research Council (CSIC) and Pompeu Fabra University (UPF), in Barcelona, Spain, found that a butterfly species endures annual trans-Saharan circuits like some birds do ―the Painted Lady (Vanessa cardui). Their results were published today in the journal Biology Letters. In a previously published study, the researchers demonstrated that painted lady butterflies migrate from Europe to tropical Africa by the end of summer, crossing the Mediterranean Sea and Sahara Desert. The fate of these migrants and that of their offspring remained unknown. “Our hypothesis was that the species initiates a reverse northward migration towards Europe in spring, thus completing a regular migratory cycle”, states Roger Vila, one of the authors. With the aim of confirming this hypothesis, they studied the natal origin of the butterflies that reached the Mediterranean region in early spring. To do so, they analysed the stable hydrogen isotopes of the butterflies sampled in Morocco, Andalusia and Catalonia in Spain, Crete, Egypt and Israel. An isotope is a form of a chemical element whose atomic nucleus contains a different number of neutrons compared to protons in the nucleus. In water, the proportion of hydrogen and its stable isotope depends on the geographical location. When absorbing water, this proportion is maintained in plants; it later remains in the caterpillars that feed on these plants, and, eventually, in adult butterflies. “It is difficult to study the movement of insects by means of observations, marking or radio tracking, since there are millions of individuals and they are very small”, says says Gerard Talavera, who led the research. “This is why finding out where a butterfly grew up before undergoing the metamorphosis by means of stable isotope analysis turns out to be extremely useful. It feels like magic”, he added. Clément Bataille, professor at the Department of Earth and Environmental Sciences at the University of Ottawa and expert in geochemistry, is co-author of this research. The findings published in Biology Letters are part of a wider project aimed at studying the Painted Lady’s migratory behaviour and routes. With that goal in mind, a global citizen science project called The Worldwide Painted Lady Migration has just been launched. 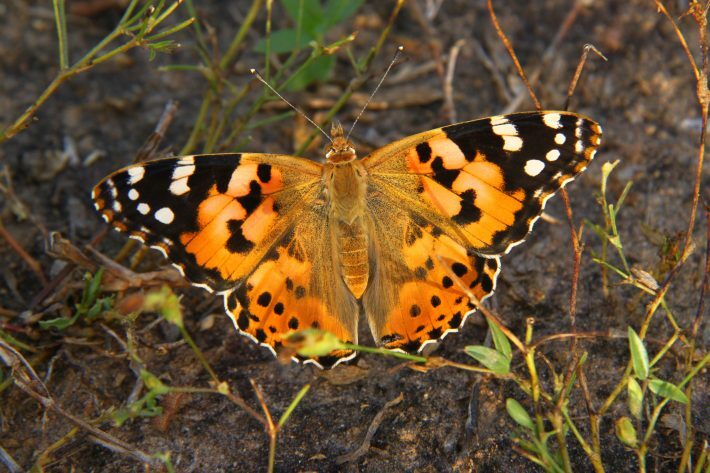 Its objective is to gather observations of the Painted Lady Migration. More information on this project is available here: www.butterflymigration.org. This research was funded by the British Ecological Society, National Geographic Society and Spanish Ministry of Economy and Competitiveness.